I hope you all had a great weekend. We went to a local cafe on Saturday, enjoyed a treat and read. I didn’t do my usual Month in Review post for September as I only finished one book all month. Definitely not my best month. I finished The One Man by Andrew Gross which I read for book group last month. It was an engaging read and a favorite read for the group. I have come across a few interesting reads and wanted to share those with you in case you haven’t heard of them. One is The Happy Reader. This is a quarterly magazine from the Penguin group. I have never seen this at my local bookstores but funny enough I saw it on the stands at a great magazine store I visited in Stockholm this summer. I didn’t get it then but when I saw my friend at the art retreat last weekend she gave me this issue. Isn’t that cool? 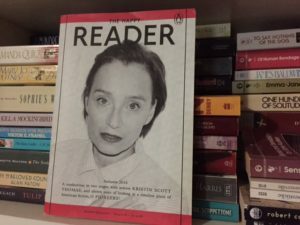 I’ve read the main Q&A with actress Kristin Scott Thomas and it’s been quite interesting. Another new source for bookishness is Girls at Library. 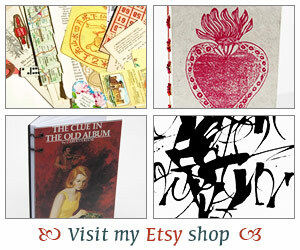 This is an online magazine about women who read and for women who read. I enjoy the interviews and the photography, after all there are a lot of pictures of books! I also subscribe to the newsletter and like the reading suggestions. Finally, Season of Stories is back. This has already started but if you like your stories short, then sign up for the daily email to have a short story emailed to you. For three months, each week, you’ll get a new short story delivered to your inbox in four installments, sent daily from Tuesday until the conclusion on Friday. I can’t wait to see what we get this week. Have you been reading any good stuff lately? Have a great start of the week! We went to a boardgame cafe on Saturday, to sample their vegan poutine, and then learned three new boardgames, which was fun. But boardgaming does cut into reading time for sure. All that new bookishenss sounds good. And the short story service is such a cool idea. Especially as so many people seem to “mean” to read more short stories but have a hard time setting up a habit of reading them. I’m reading the Giller Prize nominees for CanLit these days: so far they’re all pretty great! what a nice looking website Girls a Library is! and I had no idea Penguin had a magazine. Do they generally promote their own authors and books or is it broader than that? I feel like I didn’t read much for September, but I guess four isn’t terrible. I average five usually. I’ll have to look for The Happy Reader. I am not familiar with it.